Why Did Jenkins Smear George Woodruff? To the contrary, Caspar Whitney ranked Carlisle as the 10th best team in the country, three places behind Army even though the Indians beat the Cadets in their first-ever meeting. Still, 10th is pretty good, especially considering that he ranked them 14th in 1904. In spite of Carlisle’s four defeats (Harvard, Penn, Massillon Tigers, and Canton Bulldogs. One wonders where Jenkins found the fifth loss) Whitney ranked Harvard second in the country and Penn third. Massillon and Canton weren’t ranked because they were semi-pro teams, arguably the best of their day, in the middle of the Indians’ whirlwind 6-games-in-20-days tour. In addition to Army and the local colleges, the Indians defeated Villanova 35-0, Penn State 11-0, Virginia 12-0, Cincinnati 34-5, Washington & Jefferson 11-0, and Georgetown 76-0. Why Jenkins chose to belittle George Washington Woodruff is unclear. Maybe it advanced her storyline. Regardless of the reason, her treatment of him is unfair. Prior to coming to Carlisle, George W. Woodruff had amassed a coaching record, including three unofficial national championships at Penn that assured his enshrinement in the College Football Hall of Fame. A lawyer by trade, he left the team after the last regular season game at West Point to work at a various positions in the Roosevelt administration and with his friend Gifford Pinchot. Suffice it to say, Woodruff’s legacy is radically different from Jenkins’ slurs. Well, it finally happened. Lone Star Dietz was enshrined in the College Football Hall of Fame last weekend. It isn’t clear to me which activity at the event is the actual enshrinement: the blazer presentation on Friday evening or the enshrinement dinner Saturday night. Attendance apparently isn’t mandatory because Deion Sanders wasn’t present at either event. Lone Star Dietz wasn’t present because he died in 1964. Other deceased inductees were generally represented by their sons but Dietz didn’t have a son. Had I known that Dietz wasn’t going to be represented, I would have suggested that Sheldon Cohen speak on behalf of his late father, Gus, for whom Lone Star acted like a father. When Russell Maryland, a defensive tackle, was introduced, it was pointed out that he was the eighth Hall-of-Famer from the University of Miami. 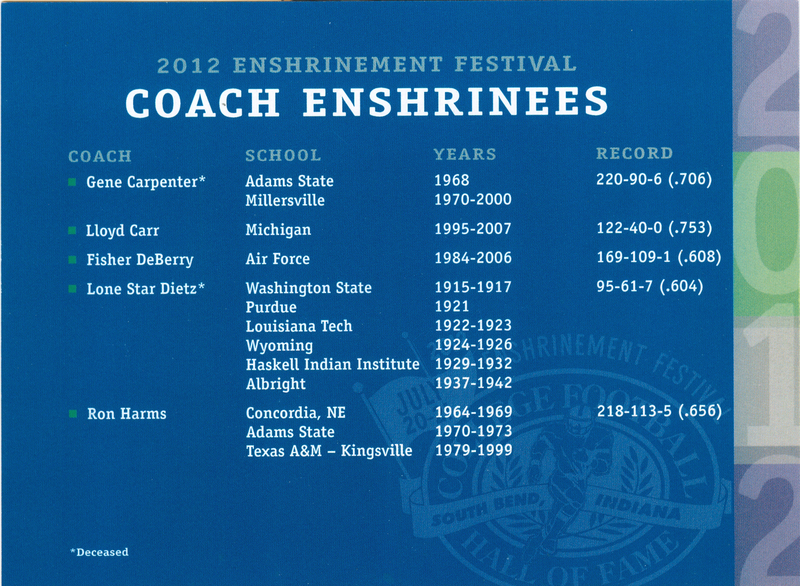 Lone Star Dietz makes the seventh Carlisle Indian in the College Football Hall of Fame. The other six are: Albert Exendine, Joe Guyon, James Johnson, Jim Thorpe, and Gus Welch. A quick look at the Ball of Fame’s website revealed that six Miami players and two coaches have been inducted. Neither of the coaches played at Miami as both played for Pop Warner at Pitt. So, as many Carlisle Indian School players have been enshrined as have Miami players. Three of Carlisle’s head coaches have been enshrined: Bill Hickok (as a player at Yale), Pop Warner, and George Woodruff. Gus Welch was Carlisle’s head coach for part of the 1915 season but he was inducted as a Carlisle player. And George Woodruff only coached Carlisle for the 1905 season. Although he led Carlisle to its first victory over Army, he would most likely have been inducted for his work at Penn alone. But one could make the argument that Pop Warner’s record and innovations at Carlisle would have gotten him into the Hall of Fame even if he hadn’t coached later at Pitt, Stanford, and Temple. Thus, by counting the six players, Dietz and Warner, one could fairly make the argument that little Carlisle, that only fielded teams from 1894 to 1917, has as many Hall-of-Famers as the prodigious producer of professional players, Miami University, which has fielded football teams from 1927 to the present. This is further evidence of the greatness of the tiny Carlisle Indian School football program. 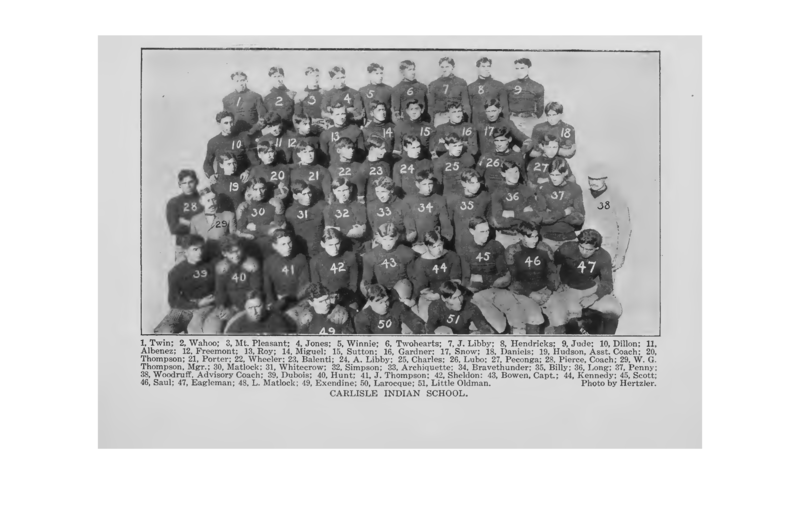 While preparing Spalding’s Official Football Guide for 1906 for reprinting, I noticed a few things about the Carlisle Indian School football team’s 1905 season. These things caught my eye because it was this very team under Advisory Coach George Woodruff that Sally Jenkins maligned in her 1907 book. Caspar Whitney ranked the Indians as the 10th best team in the country for 1905. He also placed Frank Mt. Pleasant as a substitute at quarterback on his All America team. George Woodruff placed three Carlisle Indians to his All Eastern Eleven for 1905: Frank Mt. Pleasant at quarterback, Charles Dillon at guard, and Wahoo (Charles Guyon, older brother of Joe Guyon) at end. N. P. Stauffer placed Dillon at guard on his All Eastern Eleven as well. That an authority of the stature of Caspar Whitney considered Carlisle as the 10th best college football team in the country means something and that something is that the Indians were viewed as having had a very good season. Not their best ever, mind you, but a successful one at that. These selections, along with George Orton’s observations that were posted in the June 27, 2011 message, show that Jenkins’s assessment of the type of play and success of the 1905 Carlisle Indian football team is at odds with the opinions of the experts of the day who actually saw the teams play. Carlisle fell a little below the high standard of former years, though the brilliant games they put up against Pennsylvania, Harvard and West Point proved that the Indians were yet very much to be feared in any company. They played the same style of game as in previous years in spite of their new coach; good punting, end running and tricky open play being their main source of strength. Orton completely contradicts Jenkins’ claim that Carlisle abandoned its open style of play under Coach George Woodruff in 1905. It might have been that Woodruff preferred old-style play but that isn’t what the team actually did on the field games as documented by this observer. Orton even thought the Indians played brilliantly on the soft field against Harvard where Jenkins lambasted Woodruff for unimaginative play. She covered the 1905 season more extensively than most—through the Harvard game—but made no mention of the game with Army the following week or the late-season road trip west. This is most curious because, as Sweeney documented so well, the Indians beat Army in the two teams’ first meeting ever in a game that received wide coverage, particularly because of the large number of dignitaries present for the contest. A writer with Jenkins’ pedigree and credentials could hardly have been unaware of the 1905 game given the research she did for her book. One wonders how she could have had so much wrong about the 1905 Carlisle Indians. After all, these were the young men who finally got to settle the score, metaphorically speaking, with the “long knives” on a field of battle. The 1912 Carlisle Indians were a great team, but it was their 1905 predecessors who actually did the deed. Recently, biographer David O. Stewart asked “Who’s Checking the Facts?” in his blog at: http://207.56.179.67/david_stewart/2010/05/whos-checking-the-facts.html. In that blog, Stewart pointed out a gross error in a book that “just received a respectful review from NPR.” The book in question described Aaron Burr as “tall, elegantly dressed…” when it is widely known that Burr was short and that he was called “little Burr.” Stewart wonders “Why don’t book reviewers catch such howlers? Laziness? Ignorance? You tell me…” I have asked myself similar questions with regard to the 2007 books on Jim Thorpe by Sally Jenkins and Lars Anderson. Stewart’s question caused me to revisit Jenkins’s glaring omission of the 1905 Carlisle-Army game. While trying to determine where Jenkins came up with a 10-5 record for the Carlisle Indians (she apparently included the Second Team’s loss to Susquehanna University on the same day the Varsity lost to Harvard), I noticed that Advisory Coach George Woodruff is generally credited by usually accurate sources, such as the College Football Hall of Fame and cfbdatawarehouse.com, with Carlisle’s 10 wins and 4 losses that year. This error is understandable because head coaches normally lead their teams for the entire season. That was not the case for George Woodruff and the 1905 Carlisle Indians. After the Indians beat the Cadets at West Point on November 11, 1905 (the first time the Indians played Army), Woodruff left the team and headed to Washington, DC for a government job. Thus, his record for 1905 was 7-2. The remaining 5 games should have been awarded to Woodruff’s assistant, Ralph Kinney. Woodruff’s old friend, Gifford Pinchot, had taken the helm of the newly formed U. S. Forest Service and needed legal counsel. Woodruff accepted the position as the first Chief Legal Officer for the Forest Service. Eliminating the 3 wins and 2 losses for games played after he was no longer coaching Carlisle does not dilute Woodruff’s worthiness for induction in the College Football Hall of Fame in the least. It’s just that records should be accurate.